Appreciative Inquiry (AI) is one of the most exciting and increasingly recognized concepts in facilitating organizational change. This book studies AI in depth, illustrating the method of asking particular questions and envisioning the future, encouraging staff to consider both the positive and negative systems in place and to recognize the need to implement change. It demonstrates how AI can be practically applied through positive psychology, understanding various perspectives and trialling tested approaches to create change through conversation. Case studies from organizations that have already integrated conversational methods into their change management practice show the value and effectiveness of the processes and how to promote, create and generate such conversations yourself. Written in jargon-free language, this is an excellent resource for you to discover the benefits that conversational techniques can bring to your organization and its performance. 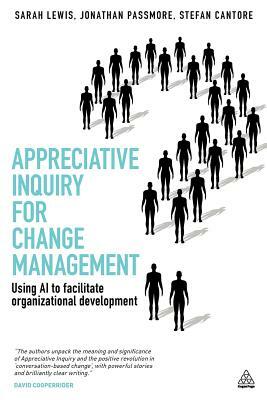 Appreciative Inquiry for Change Management explains the theory and practice of AI, World Cafe, Open Space and other conversational approaches for facilitating organizational development (OD). Sarah Lewis is a chartered occupational psychologist, an associate fellow of the British Psychological Society, and a founder member of the Association of Business Psychologists.Jonathan Passmore is a chartered occupational psychologist, an accredited AC coach, a coaching supervisor and fellow of the CIPD. He is the author of several books and editor of Excellence in Coaching, Psychometrics in Coaching, Diversity in Coaching, Leadership Coaching and most recently, Mastery in Coaching, all published by Kogan Page with the Association for Coaching.Stefan Cantore is a consultant in the areas of leadership and organizational development. “This book explains how AI works and how to use it to deal with common organizational challenges. The first part of the book contrasts the view of organizations as machines with the alternative perspective of organizations as living systems capable of using imagination and positive emotional energy to produce change….The book includes an annotated list of websites for discussion groups, online spaces, and consultancies.” – Book News, Inc.